Above is the new stuff. 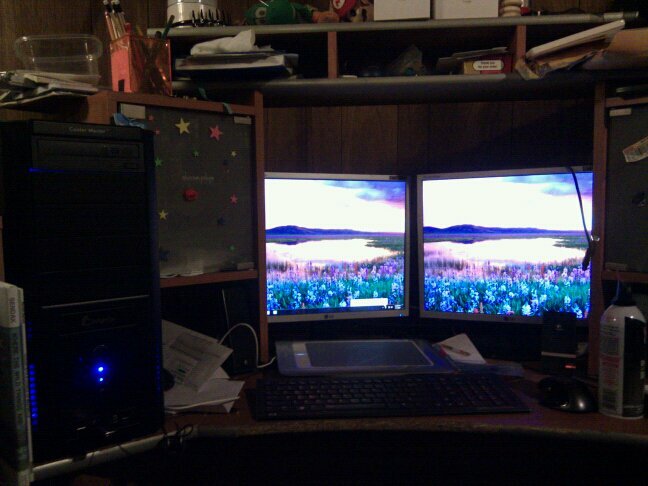 The old stuff is the two monitors, bamboo tablet, and keyboard. I’m in the market for building a new PC. I also haven’t really kept up on what is awesome in hardware since high school. I am now seeking the help of those who HAVE been paying attention to give me suggestions for the most awesome bits and pieces to slap together into a monster that will satisfy my needs. My needs include a PC capable of running the entirety of Creative Suite all at once (or at least just AI and PS), playing TF2 at the best possible frame rate with graphic settings set to the highest, and … and that’s about it. Cosmetics are not an issue. No speakers or monitors are necessary. The current PC will be going to someone else who hasn’t had a PC upgrade in 7 years, so nothing in the box can be re-used.